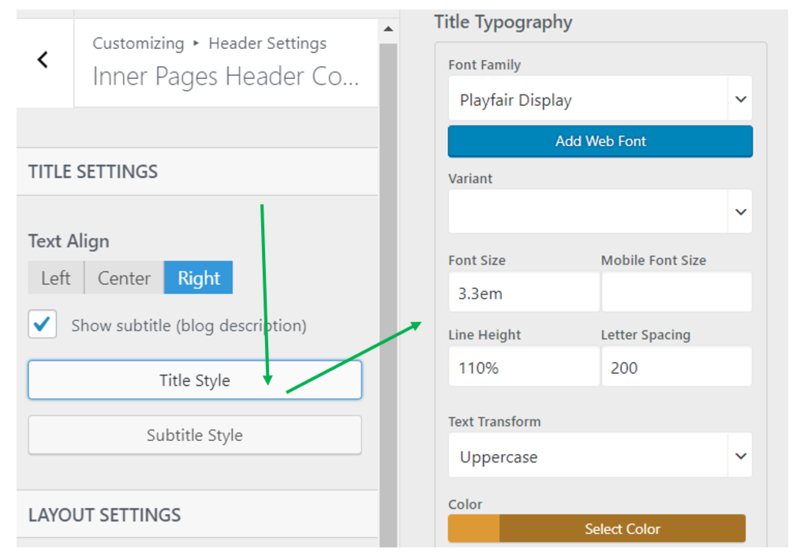 You can customize the inner pages header content by accessing Header Settings -> Inner Pages Header Content. It is recommended that you have a sample inner page open, as the customizations you make will not be visible otherwise. 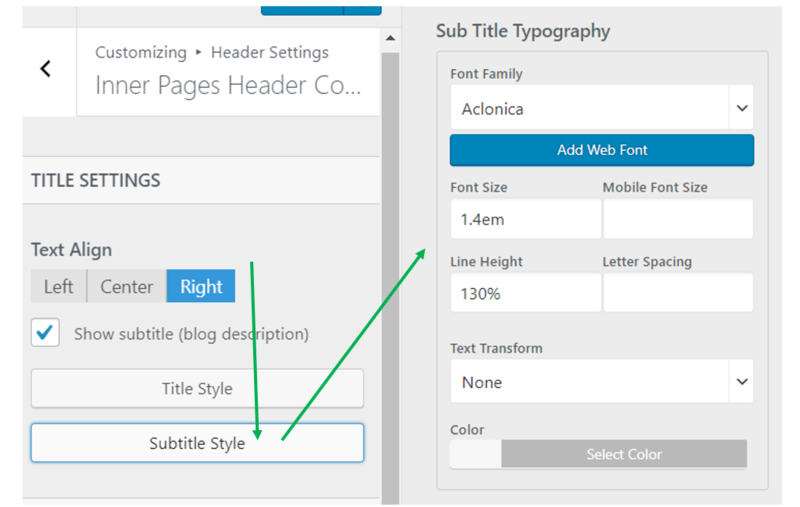 The section is split into TITLE SETTINGS (where you can customize the title and subtitle) and LAYOUT SETTINGS (here you can customize the overall layout of the header). Positioning [Text Align] – the title and subtitle can be positioned to the left, at the center or to the right, within the header. Subtitle – the subtitle is optional; hence you can choose to have a subtitle or not to display a subtitle at all. Check the checkbox to have a subtitle that you can further customize. Title Style – the text itself can be adjusted to look as desired, from the panel that opens when clicking on Title Style. You choose from different typographies (font, size, capitalization), line height, color. Subtitle Style – the text itself can be adjusted to look the way you want, from the panel that opens when clicking on Subtitle Style. You choose from different typographies (font, size, capitalization), line height and color. Here you can define the distance above the content in the header, as well as the distance below the content in the header. You can also choose to allow content in the page to overlap header, to obtain a nice visual effect. 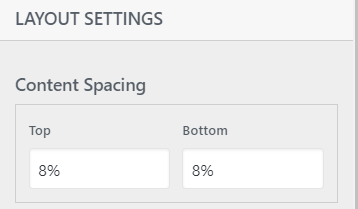 Content Spacing – as specified, this defines at which distance the content in the header is placed from the top and to the bottom. The values are given in percentages, which is best for correct adjustments on every device. However, you can choose to define these values in pixels, too. 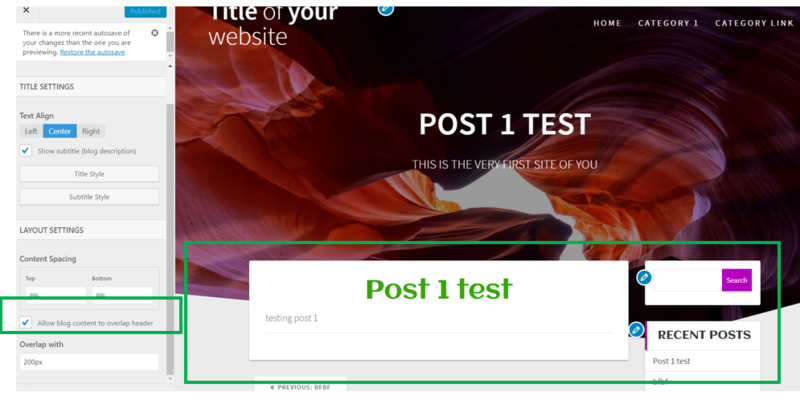 Allow blog content to overlap header – if this checkbox is checked, the blog content will overlap the header background obtaining a nice visual effect. Overlap with – this parameter controls the overlap distance (in pixels) – it only has effect if the “Allow blog content to overlap header” checkbox is checked.